So, my hair is naturally ginger (auburn/orange/strawberry blonde - I'll take any) and in secondary school this, to me, was the worst thing in the world. Granted, I got bullied for it but not only that - I hated it myself! I would look at blondes/brunettes and think 'that's so pretty, why can't I look like that?!'. After much hesitation from my mum and a lot of nagging from me - she finally agreed and I got to go to the hairdressers and have my hair dyed for the first time and I think I decided on 'Chocolate Brown'. At the time I remember a lady in the hairdressers saying 'Are you sure? You'll regret it Jordan - one day you'll be back in here asking for it back!' and I swore that I would never look back. Skip forward a few years after brown, blonde, black, purple, bright red, blue, pink and a probably a few unexplainable colours there I was sat back in that very same hairdressing chair begging my hairdresser to get the awful colour (by then a combination of purple and black) from my hair and get me back natural for prom - it wasn't that easy and it wasn't that cheap! None the less she got me back to as close as she could which was a light brown/auburn and since then I haven't touched a single drop of hair dye! Now not only have I had a variety of colours but cuts as well! After spending 11 years of growing my hair and looking after it I decided it would be a great idea to get it cut short. Now when I went for this done I went to a hairdresser I had never (or very few times) used before and she was a little bit scissor happy. This resulted in me with hair cut to my chin and me crying at school the next day because I hated it so much and I was embarrassed. As if that wasn't enough to make me learn when it finally had grown a bit I decided to do it again - newsflash I still hated it. 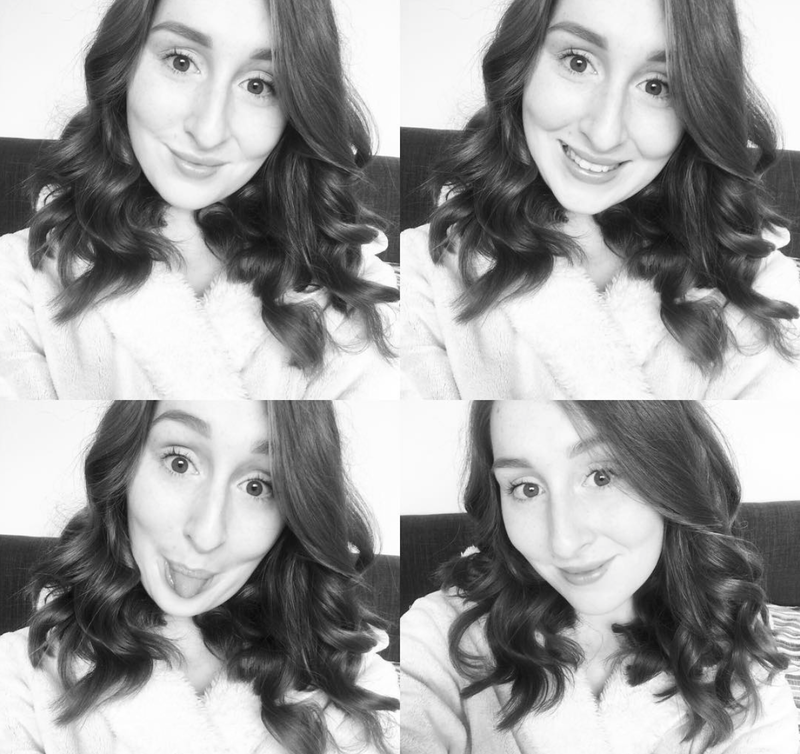 I've had full fringe, side fringe, no fringe and got bored of them all sooner or later - who doesn't? Now I am pretty much terrified of having my hair cut and I refuse to use a new hairdresser when the time for a cut actually comes around. 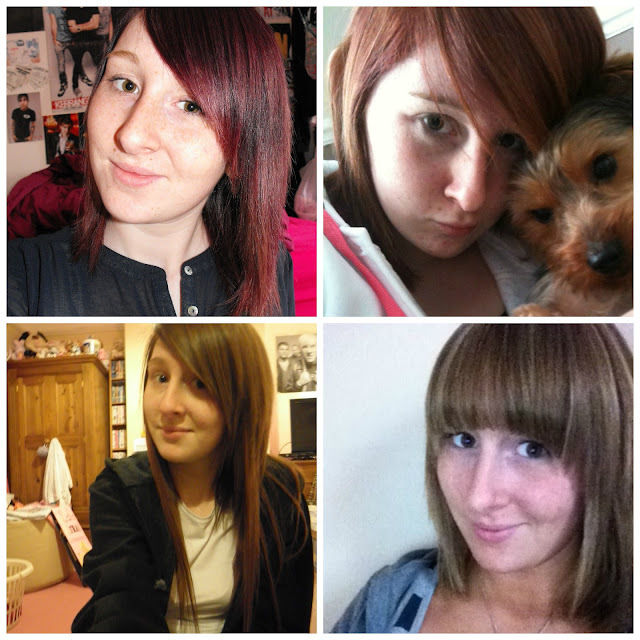 That brings me to today - I've not dyed my hair for roughly around 4 years and the condition has really improved so I thought I would share my 'Hair Story' with you all. Hope you enjoy! 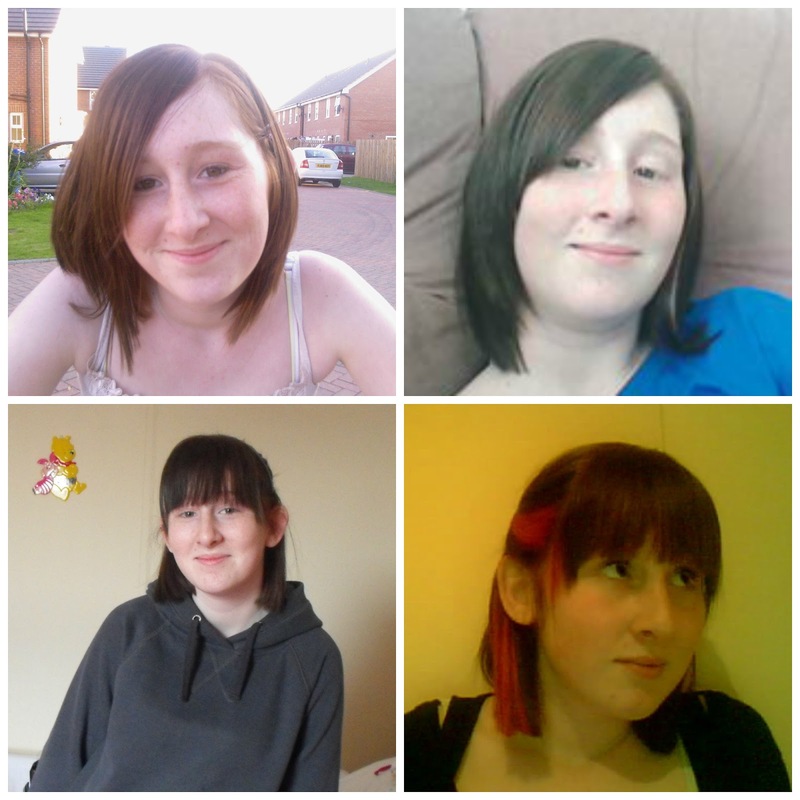 These were the years I first started to cut and colour my hair. I went immediately for the full chop which devastated me and also took years to grow (because I was silly and kept dying/cutting it). My first colour was a chocolate brown which was way to harsh for my skin tone - this over time ended up pretty much black. From here I decided to experiment a little and this resulted in pink streaks through my hair. Once again I hated it and within a few weeks it was back brown. Here I took the cuts and colours even further. 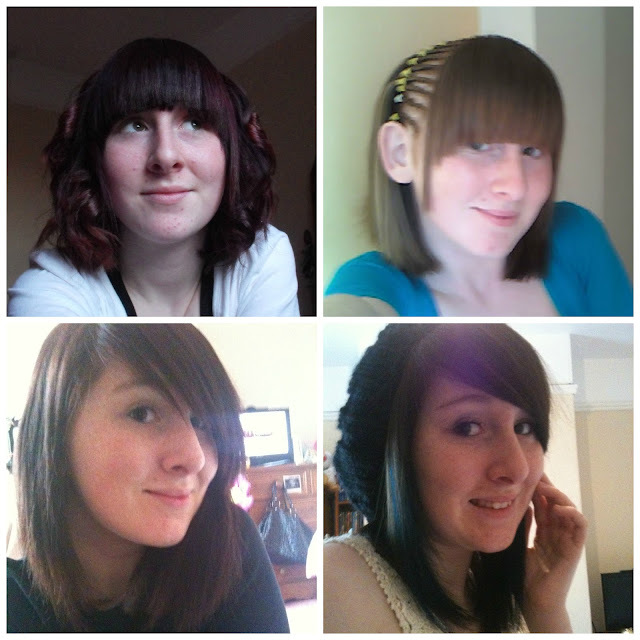 I opted for a full fringe which again was way too harsh for me and the black went to a purple colour. By the pictures it appears I then went light and almost natural for my holidays but didn't keep it for long! 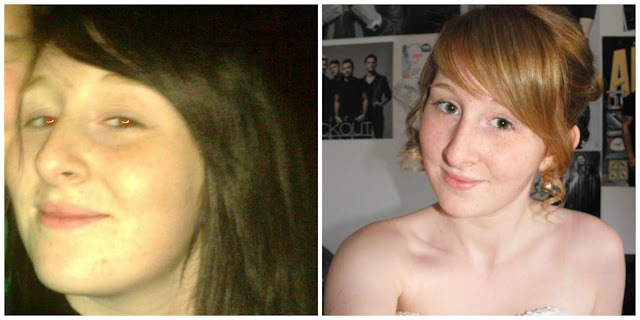 I grew the awful fringe out and went that bit darker again - with a side fringe way too big for my face I was heading into my 'emo' years. This is then when I went all out and had brown-almost-black all over with two blue streaks at the front and I LOVED it. It was still way too harsh for my but for the heavy eyeliner makeup look I was going for it didn't look too out of place! 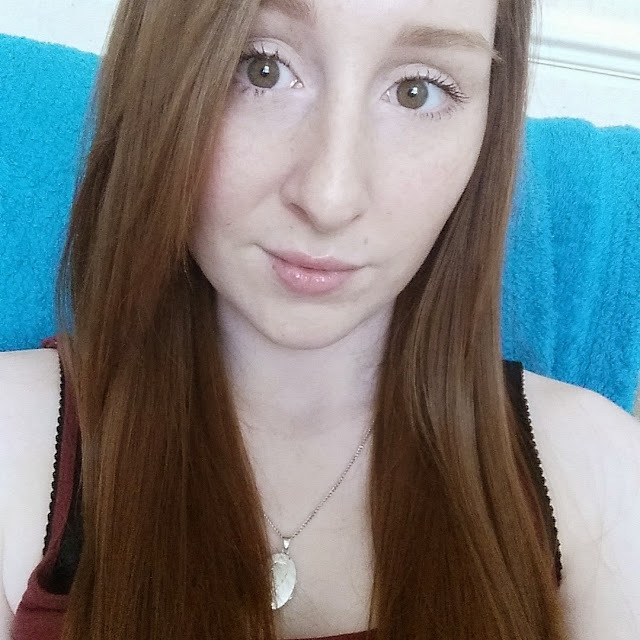 As time went on I realised my hair didn't suit me dark at all and I slowly started trying to go back au natural. The black and blue disappeared and I toned down to a lighter purple shade which I hated and was in a huge hurry to get rid of - mainly because I'd used a box colour and it was badly done. 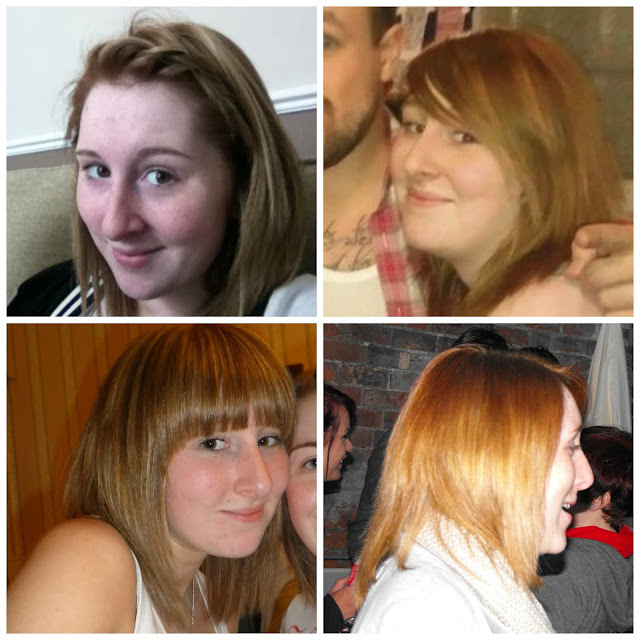 This is when I went back to a hairdresser and asked her to get me as close as she could to my natural ginger colour. However because there was such a red undertone to it already I ended up with this reddy/orange colour . After a few more weeks I went back with some extensions in hand and asked for a colour match. This is where I should have stopped as this was pretty much my colour! Queue the full fringe and blonde highlights. All these pictures as you can see are now heading back to colours that suit me most. As far as I'm aware these where all taken the same year as prom - the year I once again took a box set and accidentally dyed my hair black. As mentioned above, this resulted me in having to go back to the hairdressers and pretty much begging hair to do anything with my hair that wasn't black for prom. £70 later I ended up with something that resulted in me looking relatively normal! This brings me to today. Since that week or so before prom I have not touched a single drop of hair dye and my hair is back au natural. The condition is so much better and it actually suits me! Have you had any awful hairstyles? Whats the worse hair mistake you've ever made? Let me know in the comments below! I have had a wide variety of hair colors throughout my life (green, purple, red, pink, etc) - and tbh I'm more satisfied with my natural color than I am with anything else. My hair has thanked me for it in the long run! Anxiety - The Physical Effects.